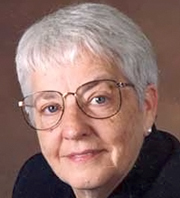 Jane Elliott in Howell, Mich.
Jane Elliott: The first thing you find out is when you put adult, blue-eyed, white males through an exercise in discrimination based on the color of their eyes, they immediately act like third-graders! Desiree Cooper: What do you mean? Well, they can't function! They can't spell. They can't respond. They can't read properly. They're angry. They're sad. They're infuriated. They riot! They become violent. I've been hit by a white male during this exercise in a corporation. What happens in the session that makes that kind of reaction? Well, in the first place, you make them stay outside of the room for an hour in a room in which there is no coffee, there are no goodies and there's nothing pleasant. You tell the brown-eyed people what you're going to do. You give them the rules for the day, you teach them the listening skills very, very quickly, and you have signs on the wall that say things like: "Blue-eyed people and dogs keep out!" and "If I have only one life to live, let me live it as a brown." Those kinds of signs, illustrated, are all around the room. After you've got the brown-eyed people prepared to go along with you with this exercise -- after you have intimidated and seduced them into going along -- you bring the non-brown-eyed people into the room. The chairs are set up so that the brown-eyed people are sitting on each side of the blue-eyed [people's] chairs and they're facing one another across the blue-eyed chairs. Then you make them sit down in the chairs in the middle. There are only half-enough chairs for the non-brown-eyed people. That makes them angry right away, because they want to sit where the brown-eyed people are, but they can't do that. You know how these people are; they always want to be where they aren't wanted. You make them sit down, and then you make some of them sit on the floor. That's a real no-no for adult white males. Do people defy you? Do people say, "You know what? We're not doing this anymore"? Yeah. And I say, "Hey, here's the way it is. Your job description for today is to be here. We're going to run this exercise. Now you're either going to stay or go. I don't care what you do. I get paid whichever you do. But you need to know that your future employment in this corporation may very well depend on whether or not you've been through this exercise. Now you do what you want to." Guess what they do? (laughs) Hey, we do it with people of color and women all the time! We say you will work in this environment whether it is racist or sexist. If you want this job, you will simply assimilate. If you don't want the job, there will be another person -- there will be another woman or person of color -- who would like to have this job. You do what you want to do. You described how some blue-eyed or non-brown-eyed people react to this immersion into a racist environment. How do people with the brown eyes react to it? White brown-eyed people are just shocked, and then delighted. People of color at first don't want to go along, because they know how it feels to be treated that way and they don't want to do it. But then they realize, after you have described what you're going to do and why you're going to do it, that this could make a very big difference in their future in that corporation or in the military or on that university campus -- wherever we're doing it. And then they go along. They go along up to the point where you tell blue-eyed jokes. Then they can see that they're beginning to enjoy this. And when they start to enjoy it, they pull back, and that's when you stop the exercise. Why do you stop it there? Because that's the place to stop it. When it begins to be fun, then you have to stop it. It has been fun for white people for years in this country. I don't want this to be a fun exercise. I want this to be an exercise that makes people realize how ugly racism is, makes people aware of what the mechanics of racism are, and why we need to put a stop to it. Well, Jane, I want to thank you for joining us. I think this is a wonderful way to convey the ugliness of racism. It is truly amazing to see how the teacher uses anything said by the brown eyes against them. If they are getting frustrated with the way they are being treated and speak out against it; they are then made fun of for being a typical brown eyed rude person. It really throws into perspective the reality of racism. Racism has always been a reality and with more exercises like this one; maybe it will help people to see through someone else eyes.